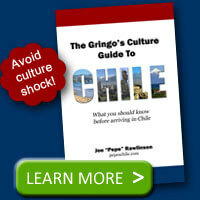 The Gringo’s Culture Guide to Chile – This is an instantly downloadable e-book in PDF format. You can view this on any computer and many mobile devices. Bonus: 14 Tips Other Chile Travel Guides Won’t Tell You – This 29 page e-book outlines 14 must-know travel tips for your trip to Chile. These tips will help you avoid unexpected travel surprises. Buy this e-book and read it. 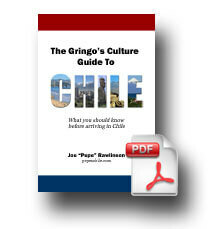 If you’re not satisfied with the Gringo’s Culture Guide to Chile, just let me know within 30 days and I’ll refund your money – that’s how confident I am that this is a resource that will help you prepare for and be excited about your time in Chile. 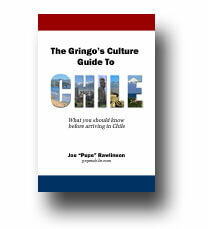 The Gringo’s Culture Guide to Chile – This is a paperback, printed version. You’ll have to wait for it to arrive but can then enjoy it like any other book on your bookshelf.